Unfold the pastry sheet on a lightly floured surface. Roll the pastry into a 15 x 10-inch rectangle and place on a baking sheet. Prick the pastry thoroughly with a fork. Bake for 10 minutes. Spread the pizza sauce over the pastry to within 1/2-inch of the edges. Top evenly with the mozzarella cheese and pepperoni. Sprinkle evenly with the Parmesan cheese. Bake for 5 minutes or until the cheese is melted. 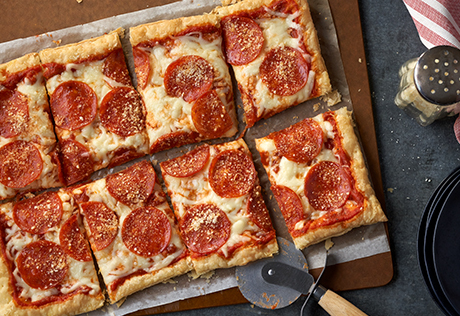 Cut the pizza into 8 pieces.